The Philadelphia nursing home abuse lawyers at Anapol Weiss strive to keep the elder community as safe as possible. Our firm takes pride in assisting families whose parents or grandparents have been neglected in nursing homes. If a loved one has been the victim of nursing home negligence in Philadelphia, hire an injury attorney to handle your claim. The nursing home neglect lawyers at Anapol Weiss have the experience to negotiate with insurance and are not afraid to go to trial. Call us today for your free consultation. What compensation can I recover in a nursing home neglect lawsuit? Unfortunately, there are many kinds of elder abuse. It’s a tragedy any time those who cared for us are hurt and taken advantage of as they age. One of the most pervasive types of nursing home abuse is their neglect by staff. Because the elderly are in a natural state of decline due to age, it can be difficult to spot health decline that results from neglect. Those who have loved ones in a nursing home should be extra diligent about signs of neglect in their loved one’s nursing home. Because signs aren’t obvious, it may take many visits and much dedication to discover this insidious form of abuse. You can file two main types of claims against a nursing home for neglect. The first option is a personal injury lawsuit, where negligence, abuse, or neglect led to the nursing home resident’s injuries. The second and more serious option is a wrongful death lawsuit, where the nursing home’s actions cause the elderly person’s death. Your loved one will need to file the lawsuit themselves, in some cases. However, signing a power of attorney can allow you or another trusted individual to file the lawsuit on your loved one’s behalf. Your loved one will need to be of sound mind when he or she signs this document – if your loved one has dementia or Alzheimer’s, this may pose an additional issue. If you cannot obtain a power of attorney document, you can obtain guardianship for your loved one. You will need to obtain this status through a court order. You will need to pay additional fees and attend more court appointments prior to obtaining guardianship. You will need to follow these steps to successfully file a nursing home neglect lawsuit in Pennsylvania. First, contact a nursing home neglect attorney and schedule your free consultation. Your attorney will meet with you and your loved one to discuss the circumstances of your case and assess your legal options. Next, your attorney will launch an investigation into the facts of your case. Your attorney will review evidence such as medical reports, nursing home contracts, security footage, and photographs from the premises. Your attorney may also speak to medical experts who can provide testimony on your loved one’s injuries. Next, your attorney will file the complaint with the Clerk of Court in your Pennsylvania jurisdiction. The court will serve the complaint to the defendants in your case. You will then enter into negotiations with the nursing home and their defense attorneys. During this time, your attorney will exchange information and negotiate a settlement based on your loved one’s injuries. Many cases reach an agreement at this stage. If you are unable to reach a settlement, your case will continue to trial. The civil court and jury will review the facts of your case and determine liability. They will also determine the amount of damages your loved one may receive. You can recover multiple forms of damages in nursing home neglect lawsuits. Courts divide the types of damages for which your loved one can recover compensation into economic (tangible losses) and non-economic (non-tangible losses). Though it may seem unthinkable that a nursing home would neglect the most basic needs of their patients, it happens all the time. It is sadly common for those in a nursing home to suffer from malnutrition and dehydration. Look for signs that your loved one doesn’t have basic needs (such as water and food). These signs could include weight loss, confusion, or sunken eyes. For the elderly, daily hygiene without help can be challenging. Nursing home neglect victims may not be getting help with basic hygiene needs, like fresh clothes or help with teeth brushing. If you noticed your loved one in a nursing home doesn’t seem to be up to his or her usual standards for cleanliness, it may signal that the staff isn’t helping them with bathing, grooming, or basic hygiene. The signs of neglect are often the signs of aging (weight loss, confusion, or trouble with balance), so identifying neglect is difficult. Perhaps the most challenging of all neglects to spot, however, is emotional neglect. There are no physical signs that your loved one is being emotionally neglected, but to someone who is lonely, it can be as bad as any other form of abuse. When staff aren’t kind or friendly to those in the nursing home or they ignore their patients completely, it is a form of neglect. Most people place their loved one in a nursing home in order for them to receive proper care – both daily care and medical care. Unfortunately, some nursing homes neglect the medical needs of the elderly. Some signs of medical neglect include bed sores. Bed sores are basically wounds from pressure – the pressure of sitting or lying in one position too long. Other signs of medical neglect include untreated cuts and failure to provide necessary medications. From employee misconduct and unsafe premises to ignored health and safety policies, many factors can lead to injuries and wrongful death suffered by the elderly in nursing homes. Unfortunately, neglect is a primary factor in most cases. Understaffing and underfunding. Without proper staff and money to run the facility, a nursing home might cut corners to make ends meet. This issue is a direct influence on many of the other reasons for nursing home neglect. Negligent hiring practices. The failure to properly train or supervise employees, along with failure to screen potentially inappropriate hires, falls into this category. An employee who ends up committing an act of abuse or neglect may have a criminal history or other risk factors that indicate that he or she is not safe to care for nursing home patients. If a nursing home does not catch these risks during the hiring process, it may be liable for a nursing home neglect lawsuit. Failure to maintain health and safety standards. Under state and federal law, nursing homes must maintain a standard of cleanliness and follow certain health procedures. Failure to maintain these conditions can lead to patient injury, illness, and death. Failure to provide hazard-free premises. Common nursing home injuries include slips, trips, and falls. Elderly people require special considerations for hazards due to poor eyesight, limited mobility, and neurological conditions such as dementia or Alzheimer’s. If a nursing home does not take steps to mitigate these hazards it could lead to significant injuries. Inadequate supervision. Nursing home patients require varying levels of care. Those who have limited mobility may require periodic shifting to avoid bed sores, while others need medication at certain times of the day. Failure to supervise the residents who need this care can lead to worsening conditions. Failure to provide medical care. Medical professionals who work in nursing homes are subject to the same standard of care as all other medical professionals. If a nursing home medical professional fails to provide medication, aftercare, or other necessary treatment, he or she may be liable for medical malpractice. Nursing home neglect can lead to significant physical, emotional, and sexual injuries to residents, as well as wrongful death. Many common injuries are powerful evidence of nursing home neglect. Nursing homes that accept Medicare must adhere to certain federal regulations that govern the standard of care. One of the most important regulations is the statute that governs safe premises and trip hazards. The environment must remain free of as many accident hazards as possible. Each resident in the nursing home must have adequate supervision and receive assistive devices to help them avoid accidents. Nursing homes are subject to standards of care in medical malpractice cases as well. If a similarly trained and educated doctor could have provided a certain standard of care, nursing home medical professionals must meet that standard as well. Criminal penalties for actions such as physical and sexual abuse, financial exploitation, and neglect are applicable as well. If you have a loved one who suffered neglect at the hands of nursing home staff, leading to significant injuries or wrongful death, you may have grounds for a nursing home neglect lawsuit. However, you will need to satisfy some conditions to establish liability. The nursing home had a responsibility to provide a certain standard of care to your loved one. The nursing home breached this standard of care in some way, such as failure to maintain safe premises or inadequate patient supervision. The breach of care led to the injuries or death suffered by your loved one. Any nursing home professional can be liable in a lawsuit. Nurses, doctors, custodial staff, supervisory staff, and any other employee that caused harm to a patient may be a defendant. However, proving liability can be complex and multiple parties may be involved. A nursing home neglect attorney can help you determine the cause of your loved one’s injuries and conduct a full-scale investigation to determine who is liable. 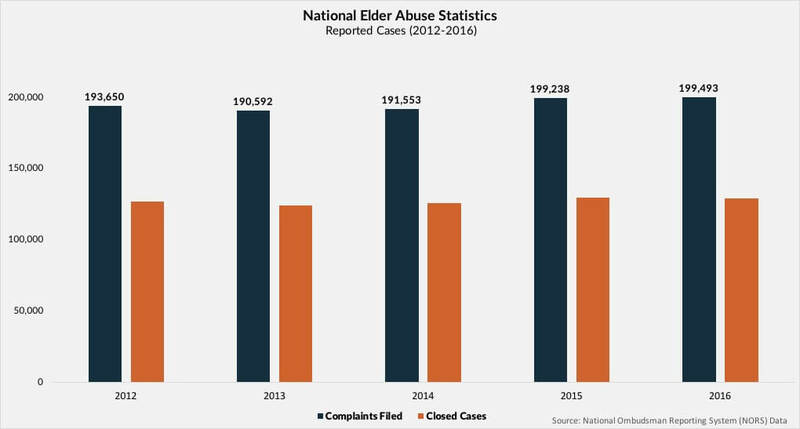 The most recent Data from the National Ombudsman Reporting System (NORS) shows the amount of reports that have been filed across the US for elder abuse between 2012 and 2016. A closer look at the numbers reveals trends in major complaint categories. This includes cases filed for abuse, environmental complaints, staffing, discharge and dietary complaints. In 2016 alone, 15, 554 of the 128, 750 closed cases involved exploitation, abuse or patient neglect. The elderly are often unable to say outright that the nursing home is neglecting their basic needs. Perhaps already confused, explaining the neglect that they are suffering is impossible. Other times, patients may fear that the neglect may turn to abuse if they speak out – another common issue in nursing homes. Afraid and unable to clearly explain what is happening, the abused person may think that they have no options. One way to protect your loved one from nursing home neglect is to have regular interactions. Though they may not be able to explain neglect, when a loved one communicates regularly, he or she may be abler to see irregularities that aren’t simply signs of age. Sadly, nursing home staff are less likely to abuse those whose loved ones visit regularly. If you have a loved one in a nursing home, be diligent about the abuse or neglect that may be happening to those who only have staff members to rely on.